The thinline line. We could include the 330, the 225, the 125 but those are full hollow. These are the models with the center block semi hollow configuration. The 355 is a rare stop tail the 335 and the 345 are the more common stop tail sunbursts. All are 59’s. 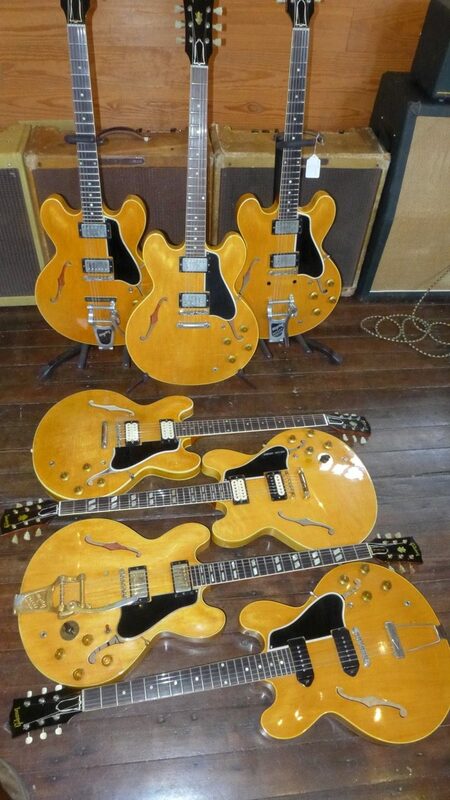 If we pretend, for the moment, that the 355 is the typical Bigsby version, then how far apart are the prices? Gibson’s semi hollow body line of electric guitars was introduced to the public in the Spring of 1958 with the release of the ES-335T. The ES stood for electric Spanish (as opposed to EH which was electric Hawaiian) and the T stood for thin line. It was a revolutionary body design but a pretty basic guitar: Plywood body, single ply bindings on the body, no binding on the neck, dot markers and those newfangled hum bucker pickups. It had more in common with the low line ES-225 than it did with the high line ES-5. It seems to have slotted into the lineup as something of a workingman’s guitar. A no frills player that would check all the boxes for both the amateur and the starving artist. The guys with the recording contracts would likely choose something a little more upscale with a bit more flash. The head of Gibson at the time was Ted McCarty. He is credited with the design of the 335 as well as a number of other innovations. He also played a major role in the development of the tune-o-matic bridge and the humbucking pickup. He’s also the man behind the Explorer and the Flying V. Important guy. 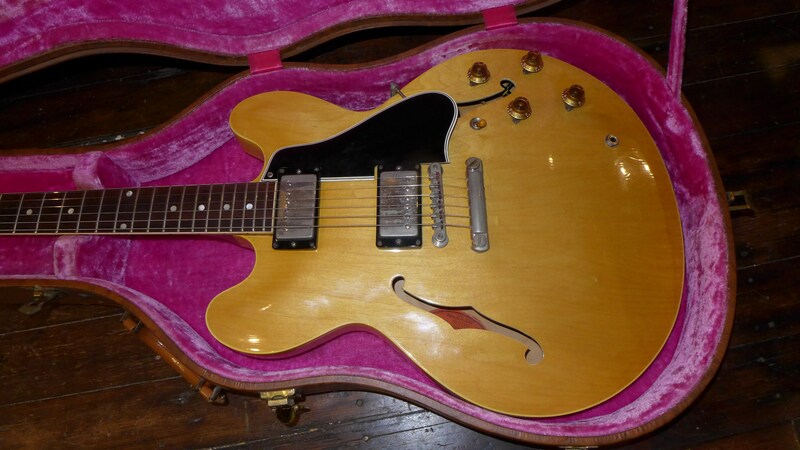 The 335 was a success right out of the gate and by the end of 1958, Gibson added an upscale version called the ES-355 to appeal to the professional player and the high end market. The 355 was essentially the same as a 335 with some fancy bindings, real mother of pearl inlays in an ebony board, fancy headstock and gold plated hardware. It also was priced at nearly double the cost of a 335. I find it surprising that anybody spent the extra bucks for what is basically bling but the 355 was pretty successful on its own. 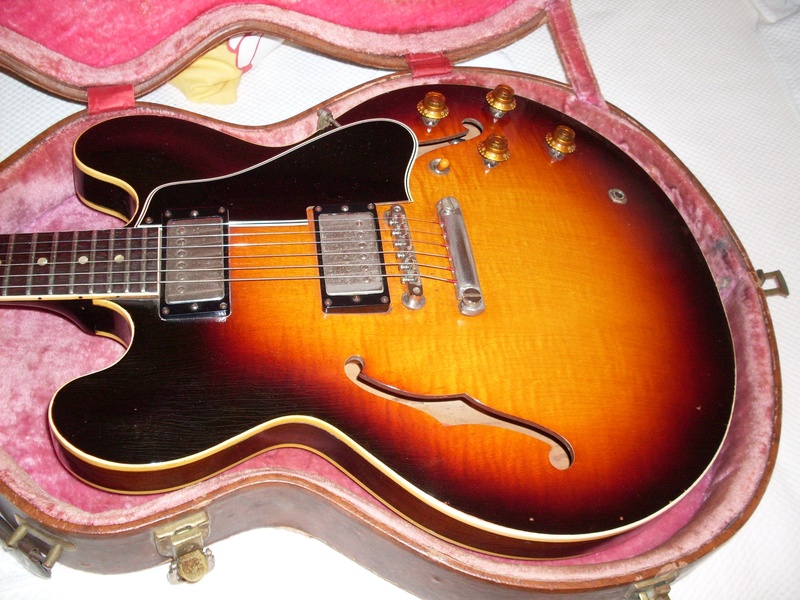 Shortly after the introduction of the ES-355, Gibson added stereo to the 355 as well as the notch filter called a Varitone to the circuit. 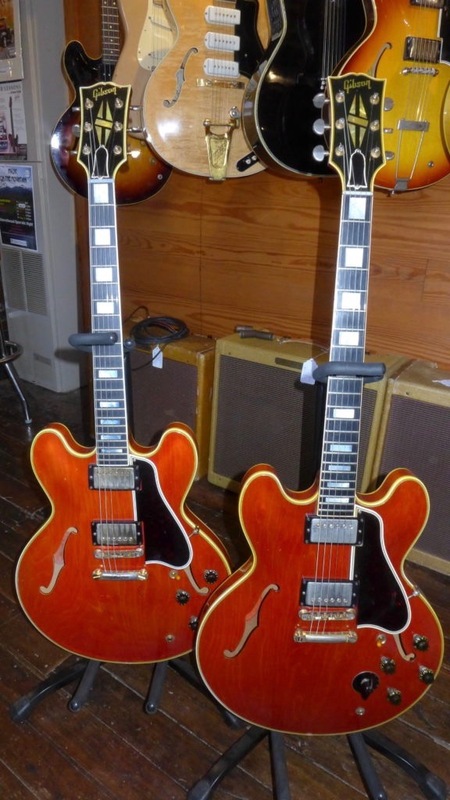 Now, at least the 355 was set apart from its downscale brother but Gibson saw an opportunity to grab a bit more of the market by incorporating the stereo/Varitone element into the 335 without all that expensive ornamentation. Think of it as first class, second class and third class. 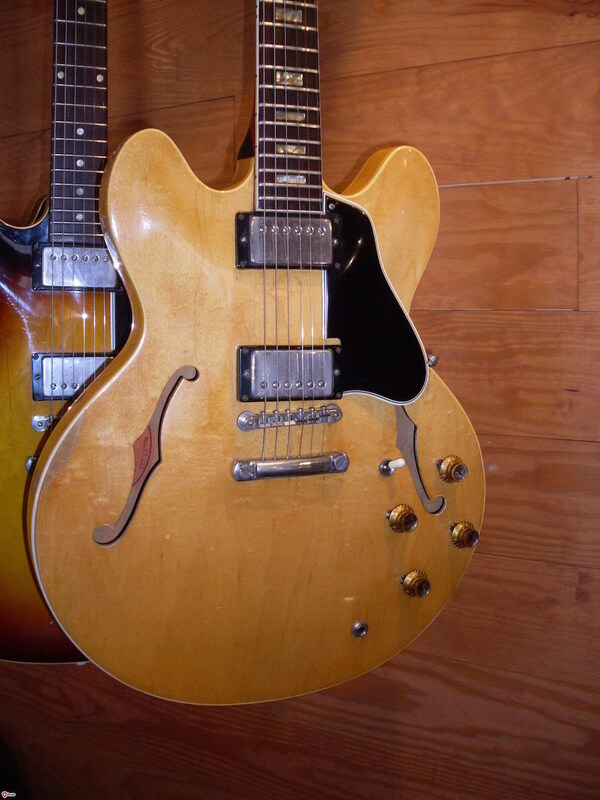 The 345, introduced in the Spring of 1959 was intended to fill a gap between the well heeled buyers of the stereo 355 and the no frills buyers of the 335. It would have the stereo circuit and Varitone, a mid level binding treatment, gold hardware and fancier inlays (but still plastic). It was priced closer to the 335 than the 355 but it completed the line of semi hollow body electrics and, like its brethren, was a success. 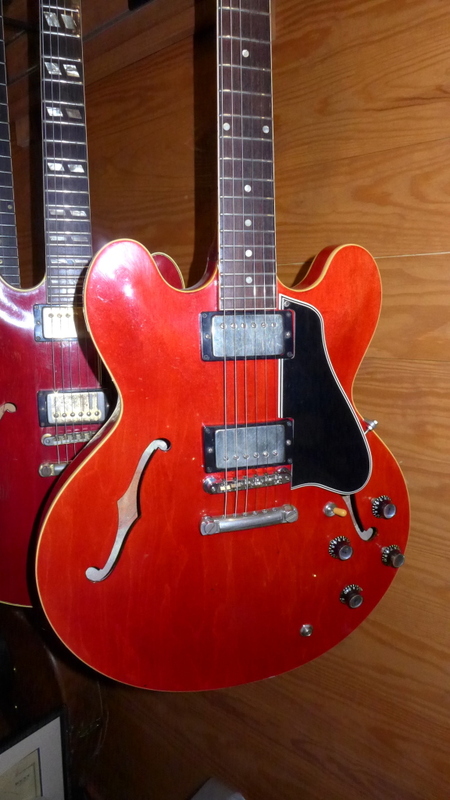 Fast forward 50 years or so and, strangely, the market for vintage ES models is “upside down.” That is, the third class ES-335 is worth as much as twice as much as the high line 355 stereo which initially cost nearly twice as much. 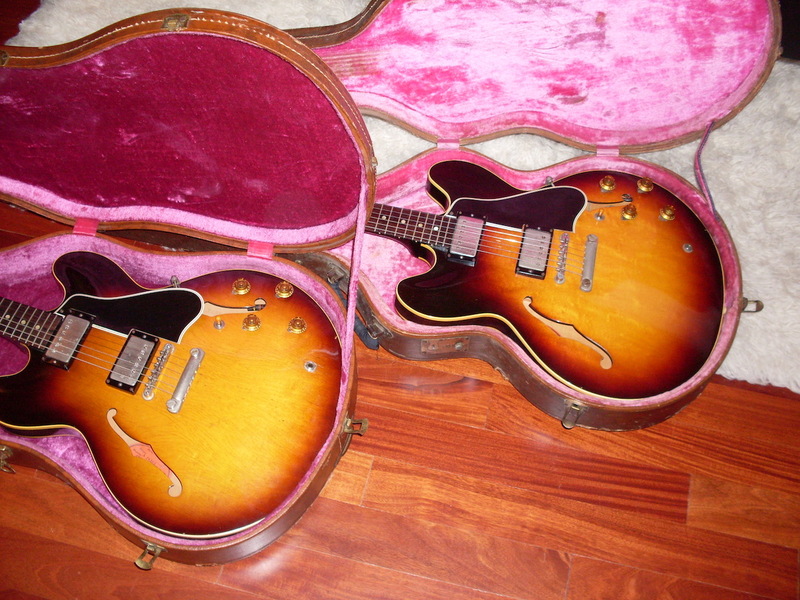 The 335 is also more desirable (and therefore more valuable) than a 345 or a 355. There has been plenty of debate as to why this is the case. 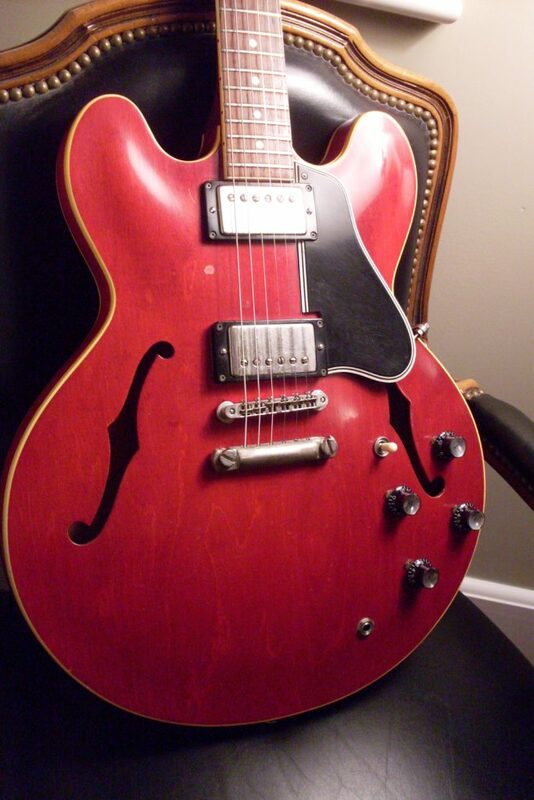 The general consensus is that folks appreciate the simplicity of the 335 design. There is some validity to that. The fancy Fender Jaguar is less popular than the simpler Stratocaster and the even simpler Telecaster. Similarly, the simple J-45 is more popular than the fancy J-200. The stereo circuitry of the 345 and the stereo 355 has long since been considered obsolete and the Varitone is largely and, somewhat undeservedly, reviled by lots of folks. Let’s leave it that the mono no Varitone 335 is more coveted than the stereo models all of which have the Varitone. 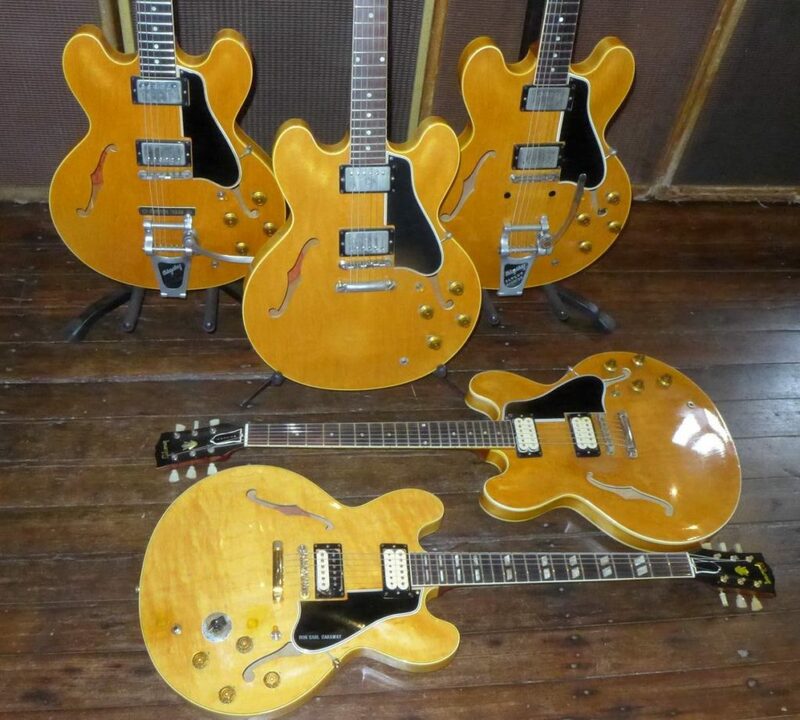 It is noteworthy that the blonde versions of all three models, custom colors and to an extent, the rare red versions of the 335 and 345 from 1959 don’t play by the same rules. A blonde 355 is about as rare as it gets. But there a fly in the ointment of this logic and that is the mono ES-355. 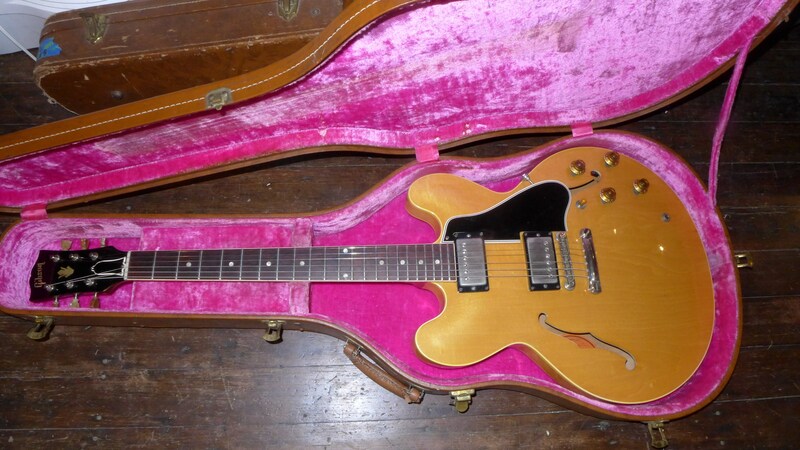 It is the same guitar as a 335 with the fancy bindings, inlays and gold hardware. 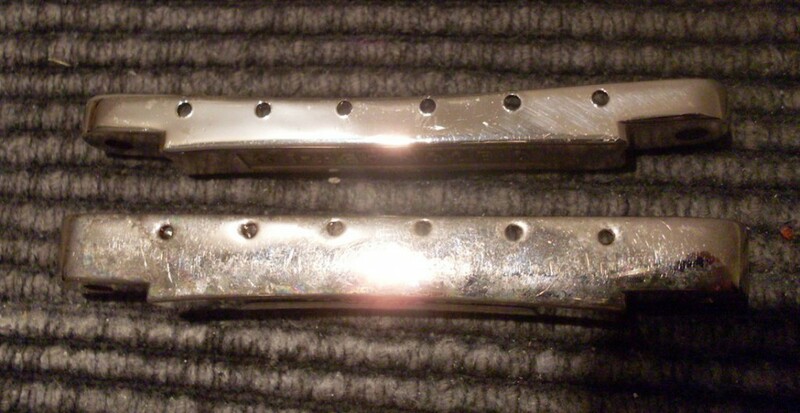 It is notable that nearly all 355’s came with a vibrato (or tremolo if you prefer) tailpiece; Bigsby, sideways or Maestro. 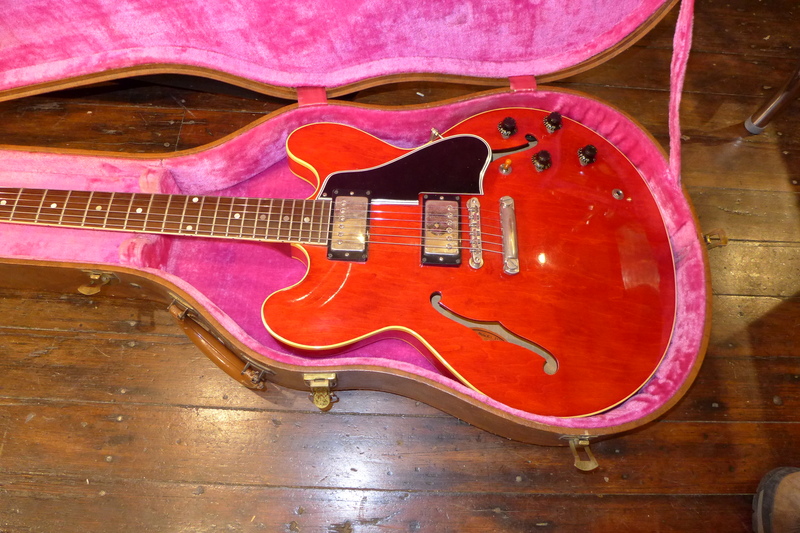 OK, let’s figure the vibrato into the mix and compare a mono 355 to a Bigsby 335. 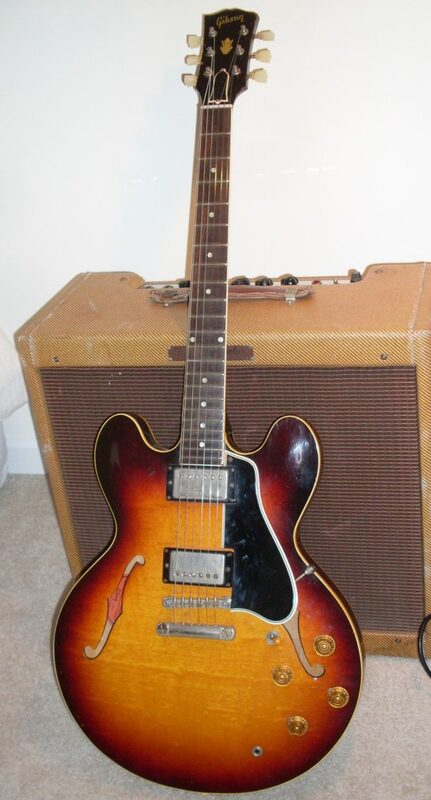 A 59 mono 355 is perhaps a $22,000 guitar today. 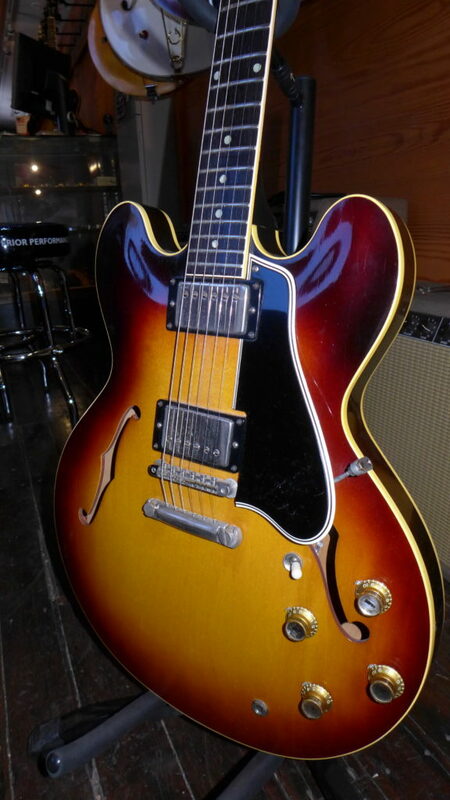 A 59 Bigsby 335 is around $30,000. Big difference. So, it makes sense that the simplicity element is a factor. But let’s throw another curveball, shall we? There are a very small number of stop tail 355 monos. All were special orders and my latest count is that there are perhaps 8 of them from 58-64 and another 8 stereo stop tails. Maybe more, probably not less. 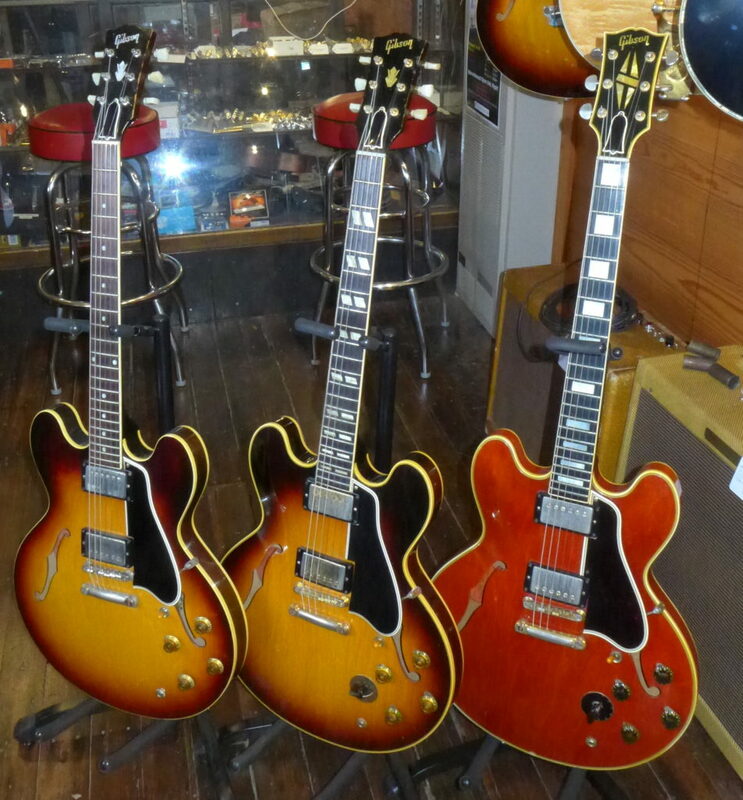 SO, whaddya think…is a mono 59 stop tail 355 worth more than a sunburst 59 stop tail 335? There are hundreds of stop tail 59 335’s and maybe four or five stop tail 59 mono 355’s. Start the final Jeopardy theme music here. OK, times up. The 355 is worth more than the 335. For once, rarity wins. 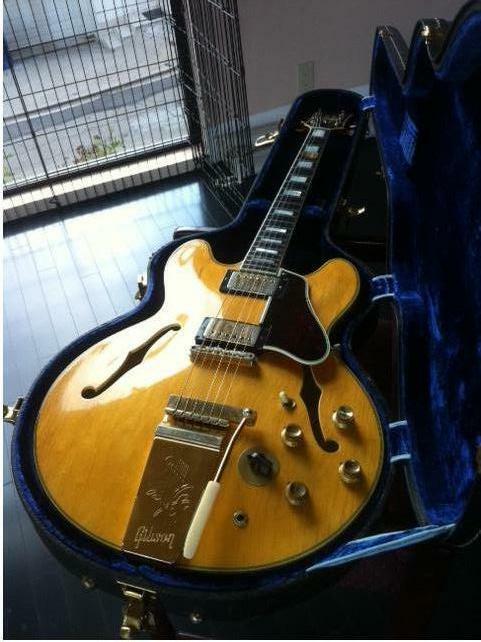 A 59 335 is one of top collectible vintage guitars-certainly in the top five of everyone’s list. Expect to pay around $40K for a no issue one. 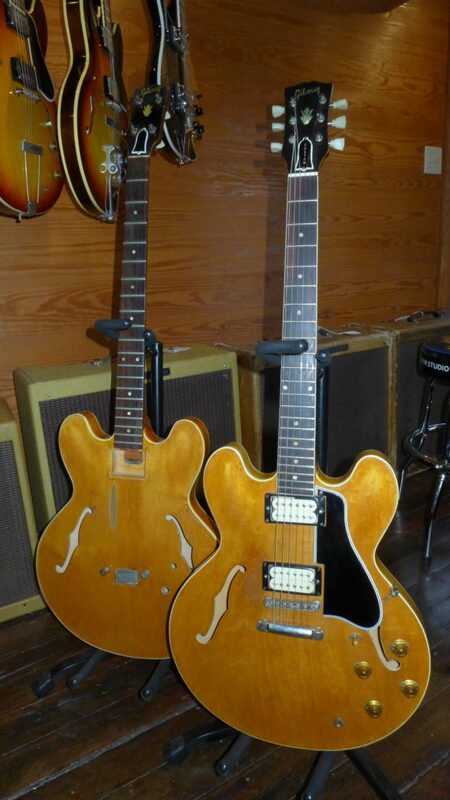 But a mono stop tail 59 ES-355 will cost you another $8-$10,000. I know-I’ve sold three of them. 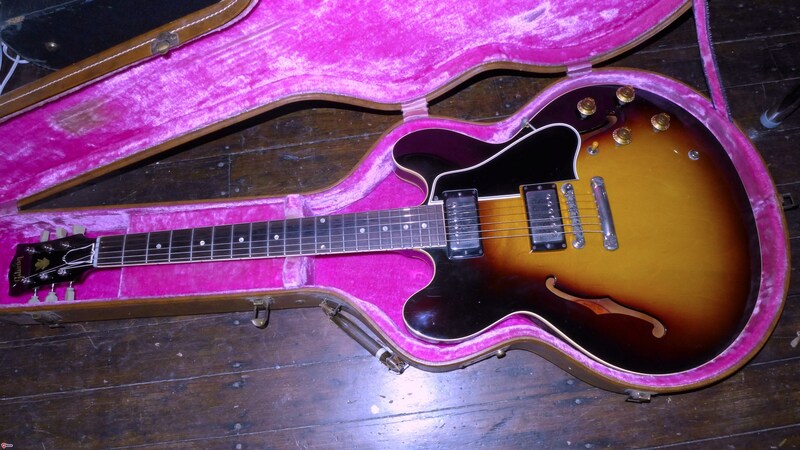 But the stop tail mono 59 ES-355 is a special case. The ES market is still upside down and will likely stay that way. The good news is that you can simply convert your 345 or stereo 355 to mono and save yourself tens of thousands of dollars. A stop tail 59 345 will cost you $20K maybe a little more for an early “first rack”. A 59 335 will cost you $40K. For the record, my main player (at the moment) is a 59 ES-345 converted to mono. A couple of super rare stop tail 355’s. One mono. One stereo. Basket case EB-2. The mad scientist in me says that this can be something pretty cool. Or two somethings. 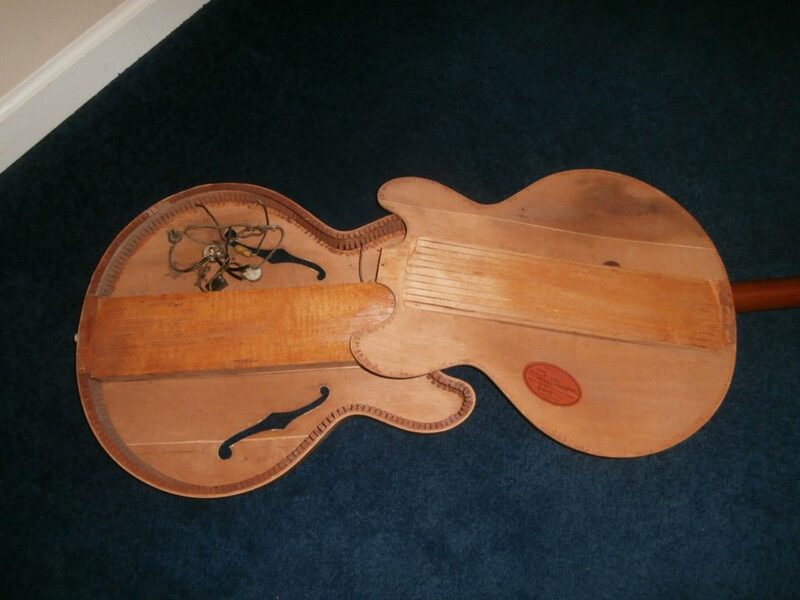 When I was in seventh grade (there were dinosaurs then), my science project was to build a solid body guitar. The science part of it was how you didn’t need a resonant body to generate musical tones; you only needed strings and a pickup. I kind of cheated in that I didn’t make the neck (I took it from a junk Teisco) and I didn’t wind the pickup (I bought a used DeArmond) but, hey, I was 12 years old. I made the body in shop class (remember shop class?-for boys only-girls took home ec). It was a slab of poplar that I shaped into a Vox Phantom (easier than cutting out a Stratocaster). The guitar worked surprisingly well and I got an “A” on the project. Fast forward 55 years and I’m still doing projects. Here’s the latest. 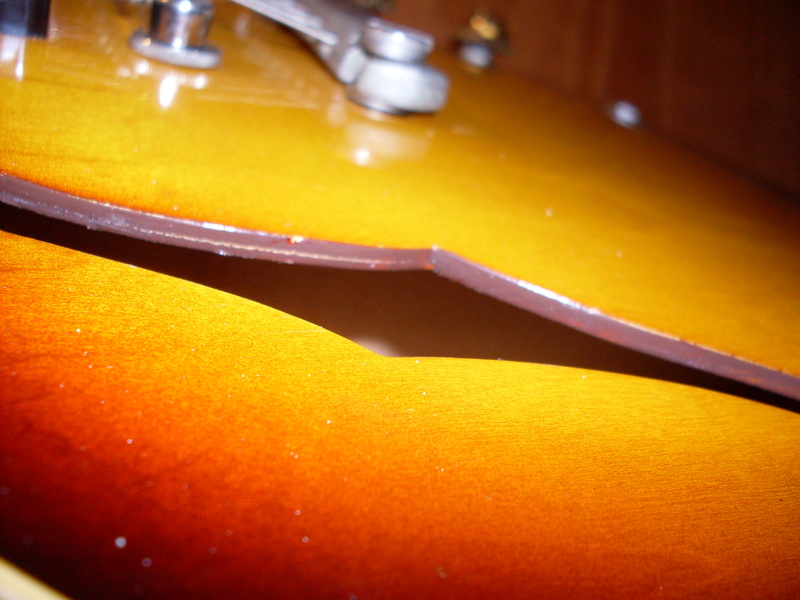 About 18 months ago, I bought a blonde Gibson EB-2 bass that had completely fallen apart. The top was no longer connected to the sides and the back was off as well. 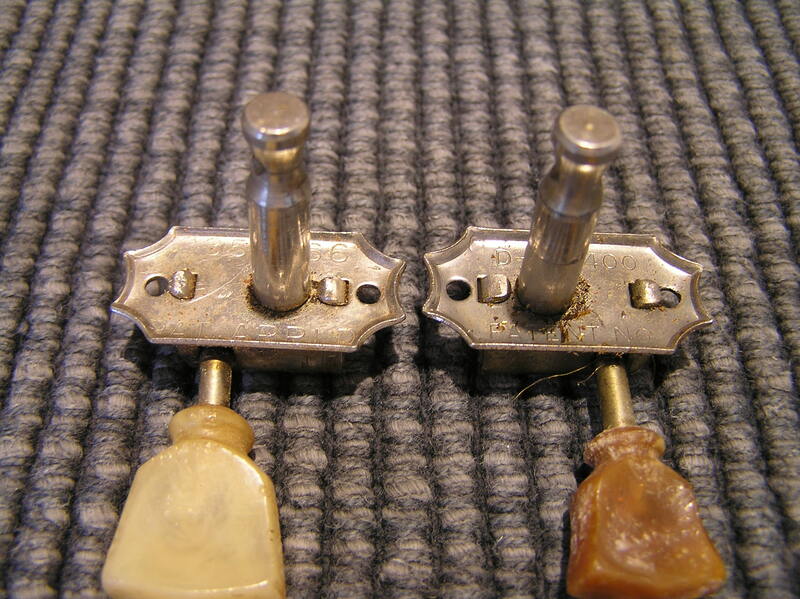 The neck was still glued to the center block but the center block was completely detached from the body. The easy project would have been to put the EB-2 back together and replace the missing parts. But that’s too easy. I had a better idea. I have the great advantage of having a good relationship with the best 335 builder there is. So, I asked Ken McKay if he could take the back of the EB-2 and turn it into the front of a 335. I figured we would use the sides for my project 335 and Ken would make a new back. I wanted to use the EB2 center block but Ken thought it made more sense to make a new one and to use the original block and EB-2 neck to make an EB-2. We had the top already-he would just need to make a new back and sides. Two for the price of one. Ken would have to make a new neck for the 335 which would be made to my personal specs (kind of a 64 at the first fret but a 59 at the 12th). Let me back up a little. I am a big believer in old wood. Even old plywood. You can’t really call plywood a tone wood but the age of the wood seems to make a difference in the tone of the guitar. 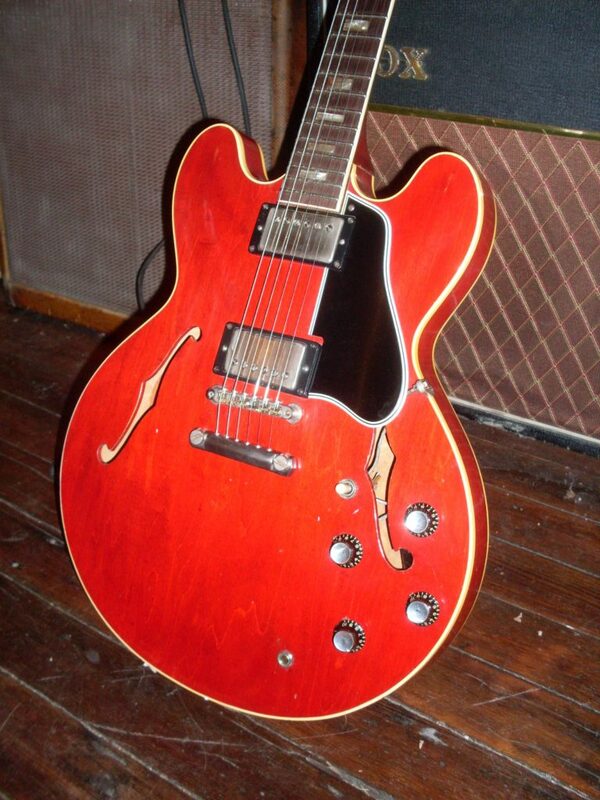 I’ve played a few hundred vintage 335’s and at least 50 new ones. The new ones play great and sound good too but they don’t have the ability to vibrate and project like the old ones. I’ve put PAFs in a newer guitar and I’ve loaded up a newer 335 with all vintage parts but it still lacks the liveliness that the old guitars seem to have. I think it has to do with moisture content but I’m not a wood expert, so I’m shooting from the hip here. The old ones are more resonant, they have better sustain and they seem to generate more harmonics. So, my project should sound pretty good. The wood that Ken used to make the neck and center block for the 335 was carefully chosen and properly dried. The plywood for the back was sourced from the same folks who used to supply Gibson back in the Kalamazoo days. The fingerboard is from a big old slab of Brazilian which I sourced back in the 90’s. I sent it to Ken and I think we got around 15 fingerboards out of it. So, a little over half of the project 335 is old wood. The project EB-2 is probably around half old wood. The EB-2 is still missing some parts so it isn’t complete yet but the 335 is done. All of the parts are vintage except for the pickups which are Wizz Clones. I may drop a set of PAFs into it if I get ambitious. The guitar feels exactly right which isn’t surprising. Ken’s new 335 builds feel like the real thing so there is no reason why this one wouldn’t. But feel is one thing. Tone is quite another. Playing the 335 unplugged tells me a lot. It is resonant and loud. You can feel the vibration in a way you can’t in a new Gibson-they simply don’t respond like that-at least not yet. Maybe in another 50 years, they will do that. Plugged in, it sounds like a vintage 335 which proves to me that modern boutique PAFs have come a very long way. Will it sound better with a good set of PAFs? Probably. But the scientific conclusion here is that there is no substitute for old wood. They’ve been “roasting” wood lately in an attempt to duplicate the resonance of old wood and, apparently, the results are pretty good. I’m pretty sure nobody is doing it with plywood however. So, I’m sticking with old wood. The next question is what is this thing worth? It sure looks authentic (except the back looks too new but we can fix that by playing it). It plays great and sounds great but it’s only around 55% vintage. So, let’s see…a blonde 59 335 is worth around $95K and 95 times .55 is, uh, carry the two and move the decimal point…$35,750. OK, I’m not going to get $35K for it but I’ll be happy to listen to offers. The EB-2 needs a bridge-the ones from 66 onward won’t fit and nobody seems to make a repro that will fit a 59.